Service members who use BFA can still fly aircraft, unlike those who use opiates, according to Vu. The one challenge she faces is a lack of BFA-trained physicians on deployment. “This requires either training prior to deployment or having a trained instructor administer the provider BFA course in the deployed location,” Vu said. But once learned, the technique is easy to use. BFA, which involves a small needle inserted into the ear, has a “central effect” on the nervous system and the cingulate gyrus, an area of the brain that processes pain, according to Niemtzow, who is the director of the U.S. Air Force Acupuncture and Integrative Medicine Center at the Malcolm Grow Medical Clinics and Surgery Center on Joint Base Andrews, Maryland. 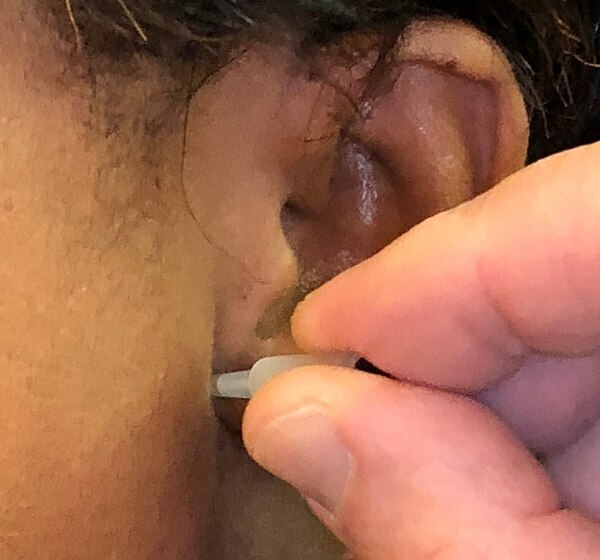 “The insertion of the needle into the ear seems to disrupt this process,” said Niemtzow, essentially preventing the pain from surfacing. Most patients who seek BFA are those who have tried traditional Western treatments and have not responded well, according to Niemtzow. But with BFA, many patients can immediately begin to feel relief. “There’s an excellent possibility that the pain will be successfully treated during the first encounter with a patient,” said Niemtzow, citing an 80 percent efficacy. Once evaluated with a physical examination, patients can begin to receive BFA, and can decide for themselves how much treatment they need. Often, it isn’t that frequent. One dosage provides relief that lasts for several days, and patients cannot grow dependent on it or require higher doses, as with oral medication. “A good majority of our patients come in several times and then begin to improve, and then we may not see them for months or years,” said Dr. Stephen Burns, chief of the Acupuncture and Integrative Medicine Center. Side effects are rare, but include irritation, infection, or bleeding. However, the three doctors say they have never seen a patient develop an infection or endure significant bleeding. Niemtzow’s long-term hope is that BFA can displace opioid usage, or at least reduce it. By removing the pain, explained Burns, patients can be on their way to solving related health issues. “If we can reduce their pain medications, they may be able to be more and more functional during the day,” said Burns. But it’s not a cure-all, said Niemtzow, and may not work on every patient. It can also be used in combination with oral medications, which Niemtzow said are helpful treatment options when used appropriately. The doctors also encourage patients to explore other holistic treatment options, and to look beyond medicine and surgery. Vu recommended full spectrum acupuncture as a complementary therapy and listed physical therapy and osteopathic manipulation as other popular modalities. “This is another tool in our toolbox,” said Niemtzow.